The Away Company Ltd is a wholly owned subsidiary of Broad Court Property Management Ltd, a large Birmingham-based Residential Letting Agent, established for over 20 years, and specialising principally in student and young professional lettings. As a small specialist travel company we aim to provide the depth of experience, and level of personal service, that you would expect from a small family-based operation, while at the same time being able to call upon the services of a highly professional 'back office'. Rural cottages and holiday villas in the Granada area, Andalucia. 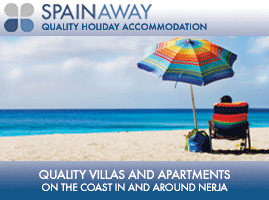 Quality holiday accommodation on and near the coast in Andalucia. 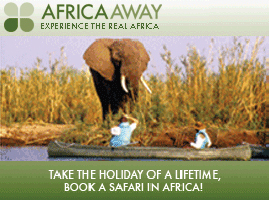 Tailored safari holidays in sub-Saharan Africa, to suit all objectives and budgets. The Away Company's objective is to provide 'The Package Holiday Unpackaged'. Unlike the package tour operator, who may impose a mark-up of at least 60% on the component parts of your holiday - accommodation, flights and car hire - we undertake that, in booking through us, you will pay no more than if you had sourced these elements independently, for example over the internet. Unique among UK-based travel companies, The Away Company has been the recipient of two of the prestigious Knowledge Based Partnership (KTP) programs, partly government funded to enable medium sized businesses to work together with a local University-based specialist team (UCE) in order to develop innovative, cutting edge, IT strategies for promoting and running their operations. These programs are enabling The Away Company to design a new generation of data-base driven travel websites, providing efficient and accurate information and booking service to our customers. We recognise that your holiday experience is of the utmost importance to you, and it is important to us that you are not disappointed.